An obituary so soon! Surely the reports of neoconservatism's death are greatly exaggerated. C. Bradley Thompson has written (with Yaron Brook) the most comprehensive and original analysis of neoconservatism yet published and in the process has dealt it a mortal blow. 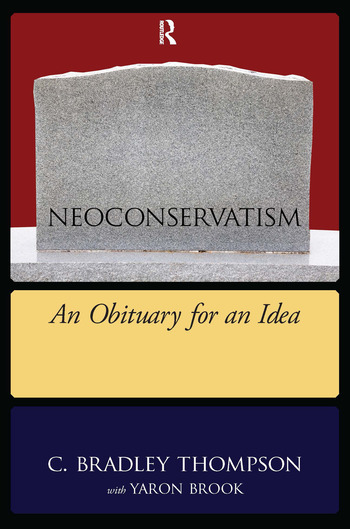 Neoconservatism: An Obituary for an Idea reveals publicly for the first time what the neocons call their philosophy of governance--their plan for governing America. This book explicates the deepest philosophic principles of neoconservatism, traces the intellectual relationship between the political philosopher Leo Strauss and contemporary neoconservative political actors, and provides a trenchant critique of neoconservatism from the perspective of America's founding principles. The theme of this timely book--neoconservatism as a species of anti-Americanism--will shake up the intellectual salons of both the Left and Right. What makes this book so compelling is that Thompson actually lived for many years in the Straussian/neoconservative intellectual world. Neoconservatism therefore fits into the "breaking ranks" tradition of scholarly criticism and breaks the mold when it comes to informed, incisive, nonpartisan critique of neoconservative thought and action.